Got an animal that Allan should take a selfie with? Why did you start capturing animal selfies? The reason I capture animal selfies: To promote happiness and inspire you to reconnect with wildlife. We’ve all seen photos of animals alone, they’re great. But it’s when you include a person’s smiling face beside them that you can sense a connection. We are connected and need them as much as they need us. 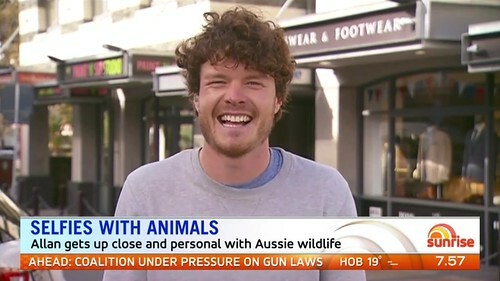 While traveling throughout Australia I would encounter animals. Luckily had my camera and tried taking photos of them. But most of the animals were curious and got closer, wanting to sniff me and the camera. They didn’t fit in the picture so I flipped the camera around a took a selfie. The first selfie was with a baby camel in 2013 and have build a collection of over a 100 animal selfies. Yes, probably less than you think though. All of the selfies are risky, but as long as I gain trust with the animal before taking the photo then I usually feel safe. Of course, never put yourself into a situation where you don’t feel safe. How do animals normally react to you? What’s your process to get so close to them? Most animals are unpredictable, but you’ll know within a few seconds if they’re happy to hangout out. Patience is the number one skill in taking the perfect selfie. Slow and steady movements not to scare them. Lie down on the ground to their level to show them you’re not a threat. You’ll have dirty clothes, but get quality photos being at their eye level. Let the animal sniff and check you out, you’re now in their personal space so let get used to you. When they get close and sniff the the camera, snap as many photos as possible. It’s a slow art. 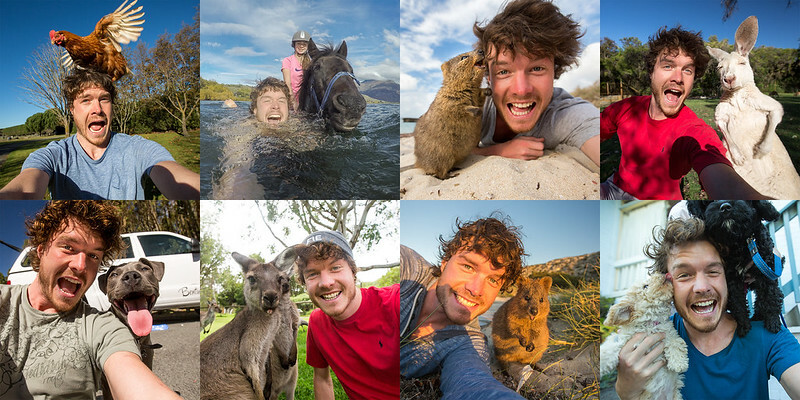 Tourism Australia first shared Allan's quokka selfie in May of 2014 to their audience of 5 million at the time. People had never heard of quokkas until this post went viral and wanted more. This is the moment the 'quokka selfie' started trending. 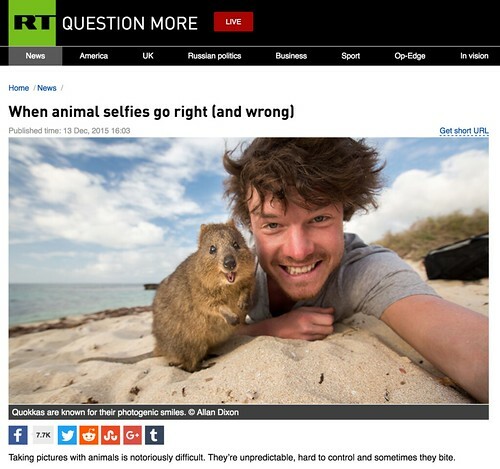 Russia Today(RT.com) were the first to publish the collection of Allan's animal selfies in Decemeber 2015. This started the craze and lead to thousands of media features across the world. When animal selfies go right(and wrong). Jetstar printed Allan's first famous quokka selfie in their onboard flight magazine. GoPro featured Allan's selfie taken with a Kea. It's one of the only Alpine Parrot's in the world. Captured on a GoPro HERO 4. Show the world your true colours. 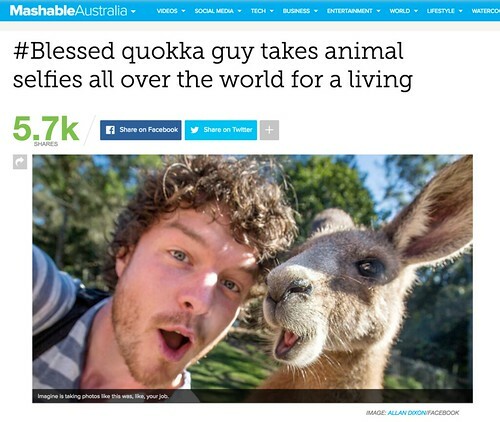 Mashable published a follow up article a year after the initial collection of animal selfies exploded online. Which then again followed with another wave of interest from media around the world. Channel 7 Australia interviewed Allan on Sunrise about the selfies noting how much joy they bring to the world.